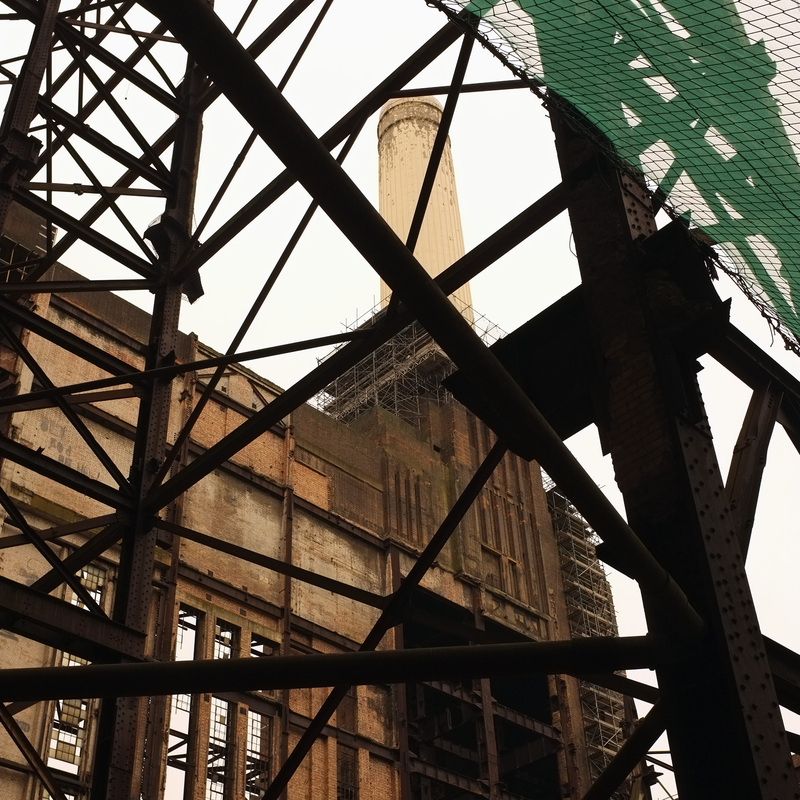 Designed by the engineer Leonard Pearce and refined by the architect Sir Giles Gilbert Scott, Battersea Power is one of the great landmarks of industrial London. As part of Open House London 2013, the derelict station was opened to the public. Construction work is set to begin later this year, so it was my last chance to see the station up close. After queuing for 3 hours I finally made it onto the site – it was well worth the wait! 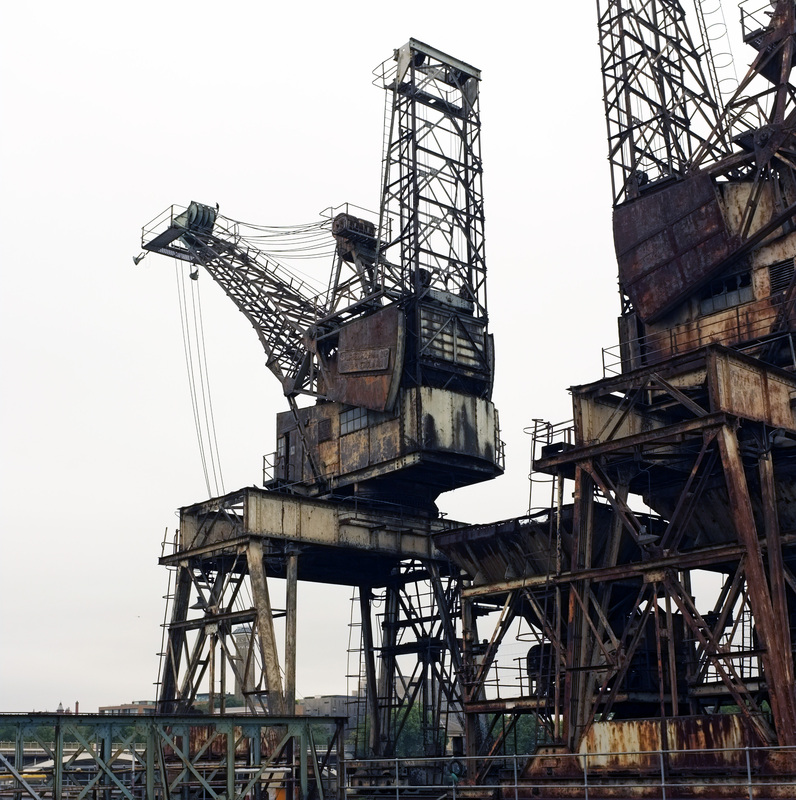 First I passed the jetty, where coal was delivered via boats on the Thames; here the station’s two rusty cranes remain almost intact. As I approached the station, the incredible scale of the construction seemed at odds with the intricacy of its brickwork. Banding to the brick base of each chimney slims down the massive towers lending the riverside façade a dramatic vertical emphasis, and a cathedral-like quality. From each of the four dark brick towers, bright concrete chimneys rise like great Doric columns – earning the station its reputation as a Temple of Power. The print (above) by Charles Potter, produced in 1936, shows the first stage in the development of the power station, before the addition of its second great hall and paired chimneys. ‘B’ station was not completed until much later, in 1953. Between each pair of chimneys lie the long boiler houses, with lower turbine halls to each side. 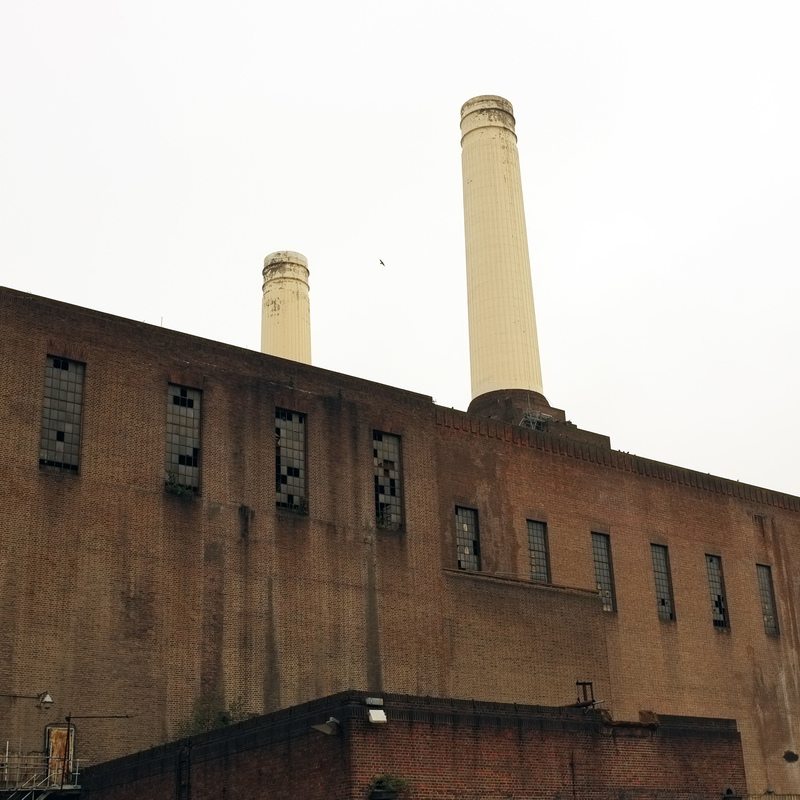 The turbine halls recede from the front and rear elevation further enforcing the verticality of the chimney towers, while adding breadth and solidity to the composition. 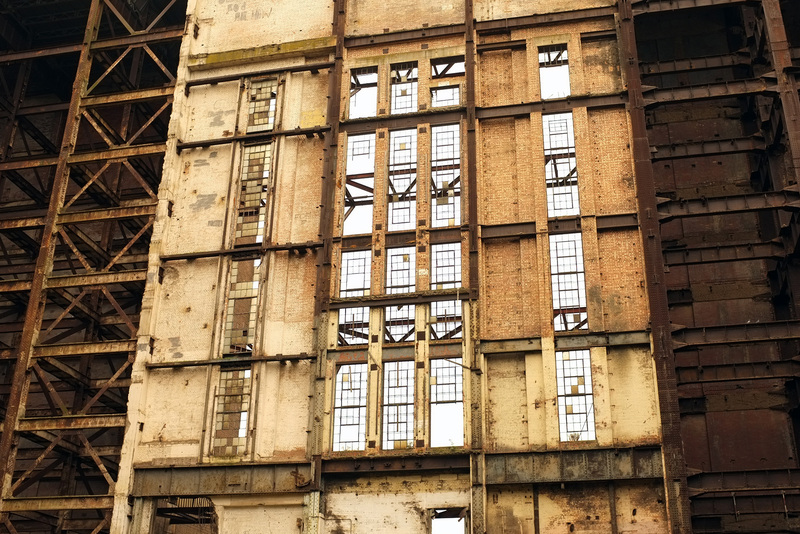 This massy impression is only skin-deep, as the building was actually constructed using a modern steel frame, much of which is now visible in the crumbing interior. In the picture below you can see the remains of the white marble tiles that clad the walls of ‘A’ station’s turbine hall. The murals are not originally, but relics from the station’s previous life as a film set. The lavish art-deco interiors that once filled this half of the station were not extended to the later phase, due to a lack of funds. Turbine hall ‘B’ was considerably less luxurious than its twin – but somehow the cheaper, and simpler glazed square tiles feel more fitting in the vast space. It was a little depressing to view the plans to transform the station into a retail and leisure centre, surrounded by residential blocks in glass and steel. It is obvious that the form of these blocks is a direct representation of the planning restrictions – every scrap of saleable floor space will have been squeezed from the site. Sadly the designer’s have failed – perhaps intentionally – to form any meaningful relationship with the original structure or history of the site. While the view from the river will be preserved, only the reconstructed chimneys will be visible from the South. The glassy screen of residential blocks that are to surround the refurbished station will completely obscure views to the brick structure of the station.